The first experimental observation of a quantum mechanical phenomenon that was predicted nearly 70 years ago holds important implications for the future of graphene-based electronic devices. Working with microscopic artificial atomic nuclei fabricated on graphene, a collaboration of researchers led by scientists with the U.S. Department of Energy's Lawrence Berkeley National Laboratory (Berkeley Lab) and the University of California (UC) Berkeley have imaged the "atomic collapse" states theorized to occur around super-large atomic nuclei. "Atomic collapse is one of the holy grails of graphene research, as well as a holy grail of atomic and nuclear physics," says Michael Crommie, a physicist who holds joint appointments with Berkeley Lab's Materials Sciences Division and UC Berkeley's Physics Department. "While this work represents a very nice confirmation of basic relativistic quantum mechanics predictions made many decades ago, it is also highly relevant for future nanoscale devices where electrical charge is concentrated into very small areas." Crommie is the corresponding author of a paper describing this work in the journal Science. The paper is titled "Observing Atomic Collapse Resonances in Artificial Nuclei on Graphene." Co-authors are Yang Wang, Dillon Wong, Andrey Shytov, Victor Brar, Sangkook Choi, Qiong Wu, Hsin-Zon Tsai, William Regan, Alex Zettl, Roland Kawakami, Steven Louie, and Leonid Levitov. Originating from the ideas of quantum mechanics pioneer Paul Dirac, atomic collapse theory holds that when the positive electrical charge of a super-heavy atomic nucleus surpasses a critical threshold, the resulting strong Coulomb field causes a negatively charged electron to populate a state where the electron spirals down to the nucleus and then spirals away again, emitting a positron (a positively–charged electron) in the process. This highly unusual electronic state is a significant departure from what happens in a typical atom, where electrons occupy stable circular orbits around the nucleus. "Nuclear physicists have tried to observe atomic collapse for many decades, but they never unambiguously saw the effect because it is so hard to make and maintain the necessary super-large nuclei," Crommie says. "Graphene has given us the opportunity to see a condensed matter analog of this behavior, since the extraordinary relativistic nature of electrons in graphene yields a much smaller nuclear charge threshold for creating the special supercritical nuclei that will exhibit atomic collapse behavior." Perhaps no other material is currently generating as much excitement for new electronic technologies as graphene, sheets of pure carbon just one atom thick through which electrons can freely race 100 times faster than they move through silicon. Electrons moving through graphene's two-dimensional layer of carbon atoms, which are arranged in a hexagonally patterned honeycomb lattice, perfectly mimic the behavior of highly relativistic charged particles with no mass. Superthin, superstrong, superflexible, and superfast as an electrical conductor, graphene has been touted as a potential wonder material for a host of electronic applications, starting with ultrafast transistors. In recent years scientists predicted that highly-charged impurities in graphene should exhibit a unique electronic resonance – a build-up of electrons partially localized in space and energy – corresponding to the atomic collapse state of super-large atomic nuclei. Last summer Crommie's team set the stage for experimentally verifying this prediction by confirming that graphene's electrons in the vicinity of charged atoms follow the rules of relativistic quantum mechanics. However, the charge on the atoms in that study was not yet large enough to see the elusive atomic collapse. "Those results, however, were encouraging and indicated that we should be able to see the same atomic physics with highly charged impurities in graphene as the atomic collapse physics predicted for isolated atoms with highly charged nuclei," Crommie says. "That is to say, we should see an electron exhibiting a semiclassical inward spiral trajectory and a novel quantum mechanical state that is partially electron-like near the nucleus and partially hole-like far from the nucleus. For graphene we talk about 'holes' instead of the positrons discussed by nuclear physicists." To test this idea, Crommie and his research group used a specially equipped scanning tunneling microscope (STM) in ultra-high vacuum to construct, via atomic manipulation, artificial nuclei on the surface of a gated graphene device. The "nuclei" were actually clusters made up of pairs, or dimers, of calcium ions. With the STM, the researchers pushed calcium dimers together into a cluster, one by one, until the total charge in the cluster became supercritical. STM spectroscopy was then used to measure the spatial and energetic characteristics of the resulting atomic collapse electronic state around the supercritical impurity. "The positively charged calcium dimers at the surface of graphene in our artificial nuclei played the same role that protons play in regular atomic nuclei," Crommie says. "By squeezing enough positive charge into a sufficiently small area, we were able to directly image how electrons behave around a nucleus as the nuclear charge is methodically increased from below the supercritical charge limit, where there is no atomic collapse, to above the supercritical charge limit, where atomic collapse occurs." Observing atomic collapse physics in a condensed matter system is very different from observing it in a particle collider, Crommie says. Whereas in a particle collider the "smoking gun" evidence of atomic collapse is the emission of a positron from the supercritical nucleus, in a condensed matter system the smoking gun is the onset of a signature electronic state in the region nearby the supercritical nucleus. Crommie and his group observed this signature electronic state with artificial nuclei of three or more calcium dimers. "The way in which we observe the atomic collapse state in condensed matter and think about it is quite different from how the nuclear and high-energy physicists think about it and how they have tried to observe it, but the heart of the physics is essentially the same," says Crommie. If the immense promise of graphene-based electronic devices is to be fully realized, scientists and engineers will need to achieve a better understanding of phenomena such as this that involve the interactions of electrons with each other and with impurities in the material. "Just as donor and acceptor states play a crucial role in understanding the behavior of conventional semiconductors, so too should atomic collapse states play a similar role in understanding the properties of defects and dopants in future graphene devices," Crommie says. "Because atomic collapse states are the most highly localized electronic states possible in pristine graphene, they also present completely new opportunities for directly exploring and understanding electronic behavior in graphene." 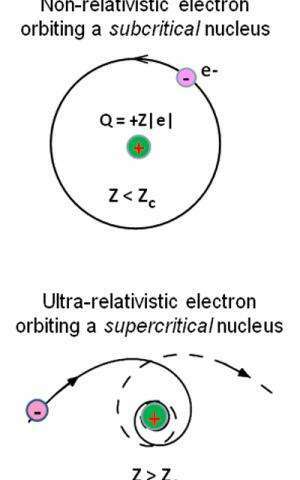 Nonrelativistic electrons orbiting a subcritical nucleus exhibit the traditional circular Bohr orbit of atomic physics. But when the charge on a nucleus exceeds the critical value, Zc, the semiclassical electron trajectory is predicted to spiral in toward the nucleus, then spiral away, a novel electronic state known as atomic collapse…. Unfortunately conventionally we still do not know why and how electron attract proton! Understanding the mechanism would help us to solve the problem as below. like the old country song: "....there's a woooman involved!" and maybe here there is a 'gluon' involved. Just a guess, nothing more. In dense aether model the classical (actually highly hyperdimensional) reality at the human observer scale (defined with wavelength of CMBR) is given with mutual balance of 4D worlds of relativity and quantum mechanics. 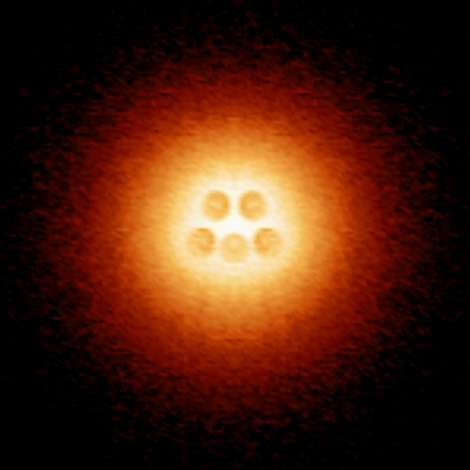 These worlds can be recognized with high symmetry ("mathematical beauty") of objects observed at the scale of atoms and perfectly spherical large stars composed mostly with atoms. But with increasing distance from these scales the observable reality becomes classical again (the atom nuclei aren't so regular like the atoms, the giant stars and galaxies aren't spherical anymore). The atomic collapse is an example of quantum effect, which is affected with general relativity, but from the opposite side of human observer scale, than the classical physics. At the most distant scales from human observer scale the Universe becomes random and particle-like again.